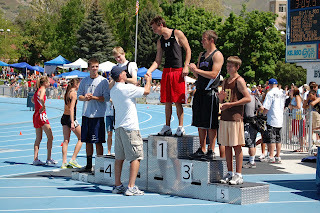 Here is Kyle being awarded his state champion's medal. I like seeing Ryan on the awards stand with him. We will be meeting as a team Monday through Friday in the mornings. On most days we will be meeting on the lawn near the gym doors at Hillcrest. There will be some travel days where we will meet at the site of the run. We will meet at 6:50 am from June 8th to June 24th and then again from August 6th until the first day of school. From June 25th to August 5th, we will be meeting at 6:00 am. I have added a link to a calendar with our workouts. You need to add a second afternoon/evening run on those days with a second workout listed. I have listed general workouts, but refer to the schedule Coach Olsen gave you for mileage totals.